Haw Par Villa is also known as Tiger Balm Gardens. 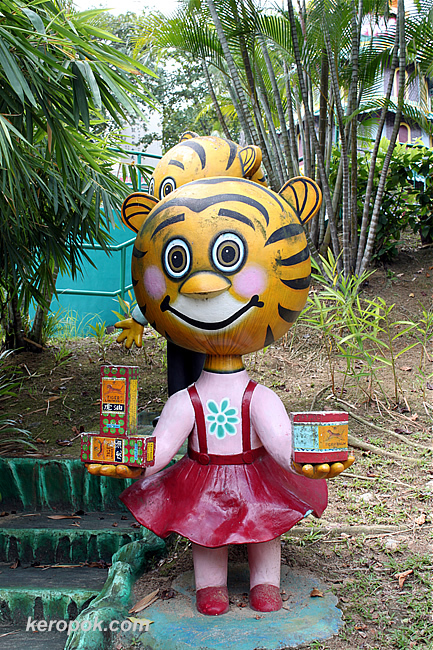 Here at the Tiger Balm Gardens, you see a meek tiger holding Tiger Balm products. Do you all use Tiger Balm? Cute! I used Tigerbalm once and it felt like I was on fire!! Very fun photo.....I have not ever smelled Tiger Balm but I definitely don't like Bag Balm (from cows). The smell is very liquorishy. if there's such a word.